We're thrilled to have Sarah Beth Durst stop by to chat about her latest novel, FIRE & HEIST. Sarah, what was your inspiration for writing FIRE & HEIST? Dragons! And heists! And were-dragons doing heists! All my books seem to begin with a spark of an idea that makes me say, "I want to write that NOW!" 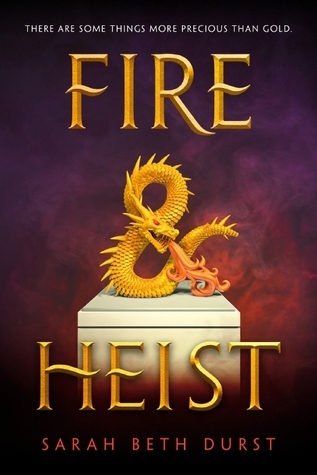 And for FIRE AND HEIST, the spark was "I want to write Ocean's Eleven with were-dragons!" It evolved from there into a story about family and secrets and a lot of snark. From a nerdy-writing-craft perspective, I have always loved the structure of a mini-adventure at the start of a story that sets the tone for the larger, primary adventure -- like in the first Indiana Jones movie, where Harrison Ford steals the gold idol. That's what I was aiming for with the first chapter of FIRE AND HEIST: a mini-adventure that sets the tone and introduces the characters and the world. It begins with sixteen-year-old Sky Hawkins hanging upside down by her knees from the chandelier in the foyer of her family's mansion in Aspen, Colorado, and hoping fervently that the chandelier doesn't break. I think it's my favorite first chapter that I've ever written. What do you hope readers will take away from FIRE & HEIST? I hope they'll laugh. I hope they'll have fun. I hope FIRE AND HEIST will take them away from the world for a few hours. One of the reasons that I read and write fantasy is because of its power to transport you out of your life and take you on an adventure -- and then bring you back again, safe and sound, maybe slightly changed. Some might dismiss that as "escapism," as if it's a negative. But I consider it important self-care. Books that entertain are also books that heal tired hearts and souls. And that's what I hope to do. I write every day at home while listening to music. This doesn't work for everyone -- everyone's brain works differently, so everyone has a different writing routine that works best for them -- but all three of those things are essential to my writing process. Writing every day keeps the momentum going. Writing at home keeps me focused. (I tend to eavesdrop whenever I try to write in coffee shops.) And writing to music helps distract my critical editing brain until I'm ready for it to chime in. The other thing that's key to my writing process is chocolate. Lots of chocolate. There's a temptation to compare your first draft to a finished book on your shelf and think, "Mine's not good enough," and then abandon it. But that's not fair. That finished book has been through multiple drafts plus an entire editorial process. You need to give your story a chance to grow and evolve. You wouldn't yank a carrot out of the ground to see how well it's growing. Leave your story in the dirt. Let it spread roots, let it fluff out that green leafy stuff on top... okay, I'm not a gardener. Never mind this analogy. The point is that you should be kind and gentle with yourself while you develop your story. You can be ruthless later, when you want to hone your craft, but in that first stage, when you're coaxing a story out of the shadows... don't scare it away with self-doubt. If it helps, lie to yourself. Tell yourself you're only practicing. Tell yourself that you're just playing with words. And see what arises. It could be something magical! I write fantasy for kids, teens, and adults. My current book for YA is FIRE AND HEIST, which is out right now (yay!!!). My next book for adults (coming in March) is THE DEEPEST BLUE, which is a standalone epic fantasy in my world of Renthia, about a young woman who is an oyster diver with the power to control sea monsters. And my next book for kids (coming in May) is SPARK, about a girl and her lightning dragon and how even a quiet voice can change the world. 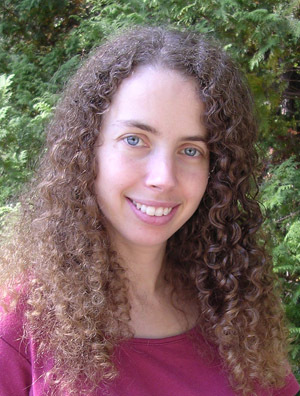 Sarah Beth Durst is the award-winning author of sixteen fantasy books for adults, teens, and kids, including The Queens of Renthia series, Drink Slay Love, and The Stone Girl's Story. She won an ALA Alex Award and a Mythopoeic Fantasy Award, and has been a finalist for SFWA's Andre Norton Award three times. She is a graduate of Princeton University, where she spent four years studying English, writing about dragons, and wondering what the campus gargoyles would say if they could talk. Sarah lives in Stony Brook, New York, with her husband, her children, and her ill-mannered cat. For more information, visit her at sarahbethdurst.com. Have you had a chance to read FIRE & HEIST yet? Are you kind to yourself while coaxing a story out of the shadows? Does chocolate help your writing process? Share your thoughts about the interview in the comments!